The last time we had dinner was during Grace's birthday celebration at Giligan's. And that was October. somehow, you'll feel at ease. And I was. I am. The first Christmas party with them was in Julius' residence. It was inuman until morning. The second one, which was two years ago, was in EA's residence. 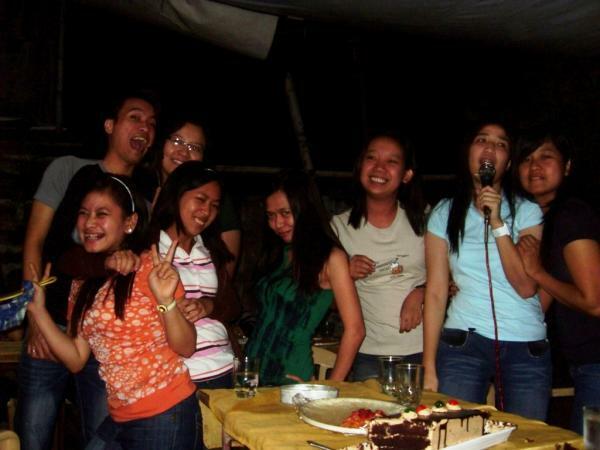 It was a videoke party. And so, when I was planning the get-together/reunions that I'll be attending this year, I added them on my list. Despite having no definite plan yet. I initiated on contacting them. I emailed them - EA, Jelai, Bing, Grace, Roy, Ai, Pards, Z, Ivan and Paula. Ai, Pards, Ivan and Z didn't confirm though. 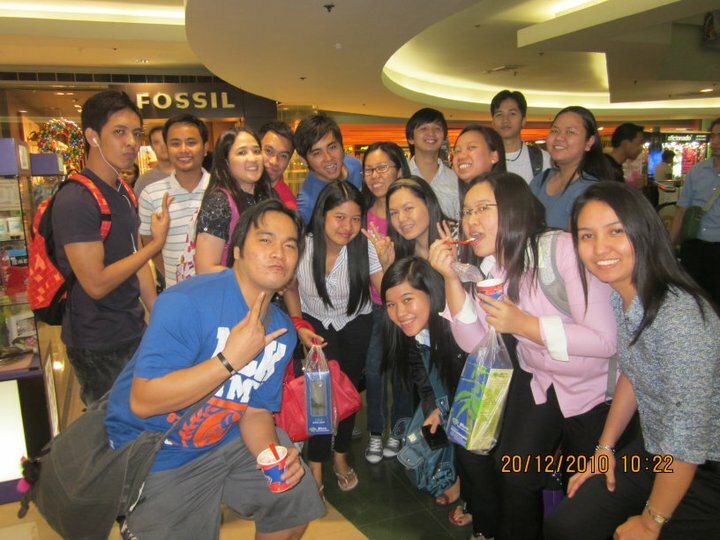 We decided on the date - December 20, and on the venue - SM Megamall (the usual meeting place!). Then, I sent an SMS to everyone. Many responded positively. Since we couldn't schedule a Christmas party in our province, we opted for a Christmas dinner. the first choice has been Dads - The Ultimate Buffet Restaurant. But it's rather too expensive. So we tried to google for other restaurant in Atrium. But still we opted to Kamayan. They have 10 + 1 forever promo anyway. On the 20th, I called Dads. I was going to reserve for 12 at a 7.30pm dinner. But I was informed that they only accept until 6.30pm reservations. So I called EA and informed her about it. I told her to proceed to Kamayan, and we didn't have a reservation. At 6.30pm, I texted everyone. And just when I was about to leave the office, the developer on the defect that I was working pinged me. And I had to stay for an hour more to resolve the issue. Talk about good timing! So, ayun late ako. It wasn't my first time eating at Dads. But this was the first time that I got a little disappointed. There were not enough food. I mean, even fruits! We (I mean, not just us but other people as well!) were still eating but they were already fixing their stuff. It's supposed to be an eat-all-you-can restaurant for crying out loud. Anyway, did I mention that they each ordered a bottomless iced tea? Well, they did. 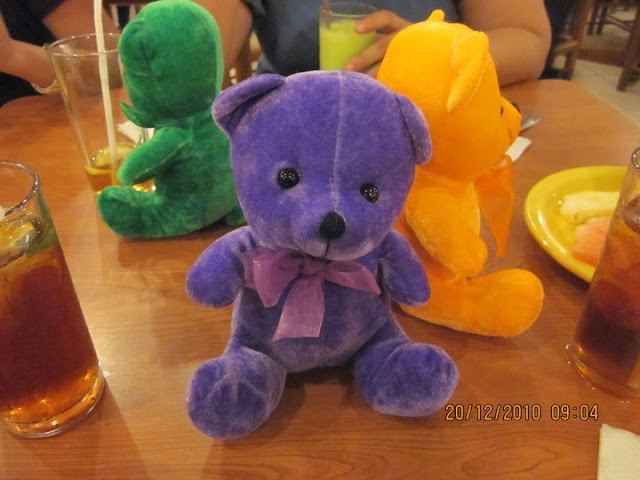 Of course, they each got a bear. I thought the budget was 400php max!! Kahlil arrived with William just when we were about to leave. 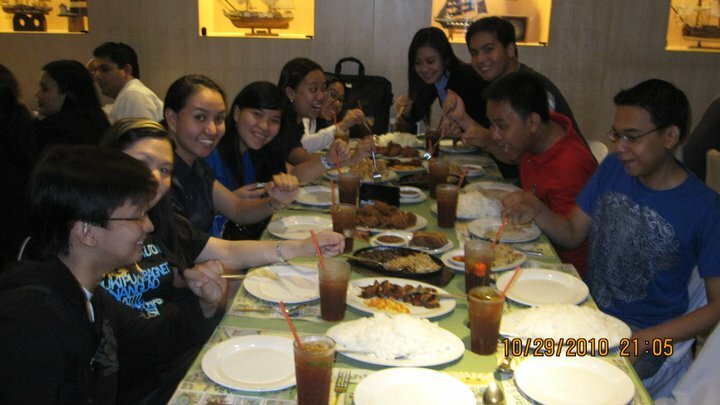 Then we went to Cabalen because Julius and Mhoe were having their batch dinner there. Overall, I must say that this is a well-attended dinner - Tsina, Jelai, Ea, Grace, Bing, Paula, Ronald, Lester, Mandap, Mark, Kath, Roy, RC, Rio, Glai and Ofel plus Kahlil and William plus Julius and Mhoe!! To many more years of friendship, cheers!! One reunion down. I still have five more!! Hectic schedule, ei? XD 5 more reunions equal 5 times more fun. may you enjoy them all! @ Raffy Onga, eh. Tinatamad tuloy ako, joke. =p Happy Holidays din. ang saya naman ng mga reunions!!! happy times! kumusta na sa DADS? Ok pa rin ba ang buffet offer nila? haven't dined-in there for the longest time. @ Aajao Ayus naman. Sa tingin ko okay pa din. Wag lang siguro late dinner. LOL. huwaw! ang saya saya naman! merry christmas nga pala sayu Tsina :) God is with us. hehe. 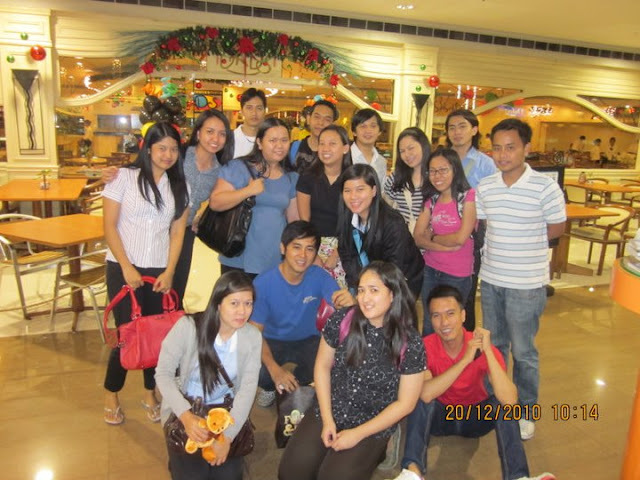 We're having a high school reunion for the 4th time this December 28. But again, I feel like I'm not going to the reunion, because ang payat payat kon nah. lol. And yeah, they're expecting something for me because I just came back from abroa. Oh well, that's already almost 6 months ago and I have no money for fee. :D I haven't received my salary yet. I don't know what will this 28. For sure they will come to find. With my berks in college, We're only three left. Others went abroad. Nakakatuwa mag-reunion basta classmates mo before. I'm not that in-touch with my high school classmates so it's mostly my former college crowd that I meet up with during vacations. Nakaka-OP nga lang kung kinsan since most of them are already lawyers while iilan lang kami who chose to veer away from that career path and ended with the BPO industry. @ Madz Yup. I did. =) Small world nga, hahaha!